Every month at my grocery store, Tesco, they put out a new complimentary food magazine with recipes and lately it has been my cooking inspiration. 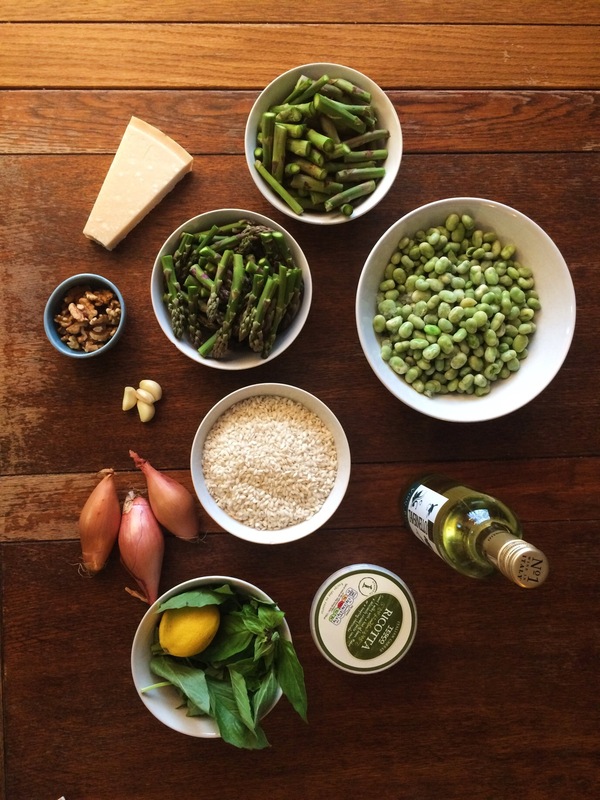 This month I made several recipes from the May issue and this spring green risotto is going into my regular meal rotation. 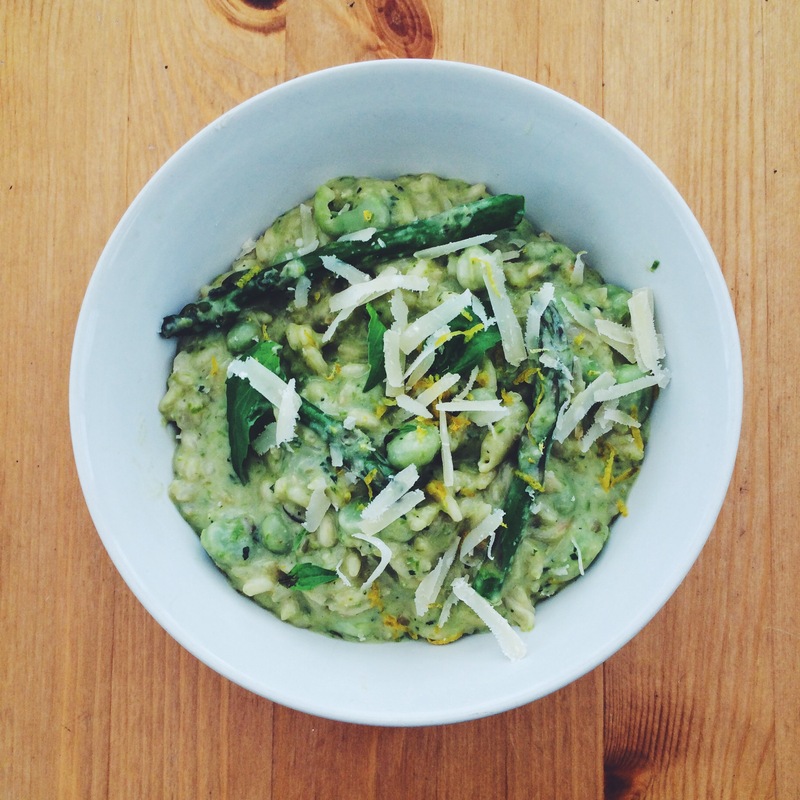 I already love risotto, but the idea of adding pesto takes an already incredibly flavorful dish to a whole new level. 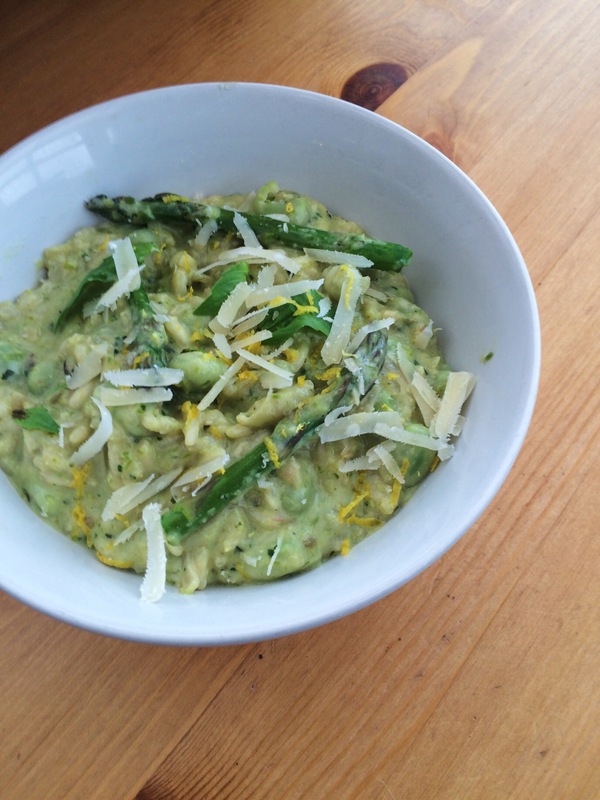 Asparagus Pesto Risotto? Yes please. 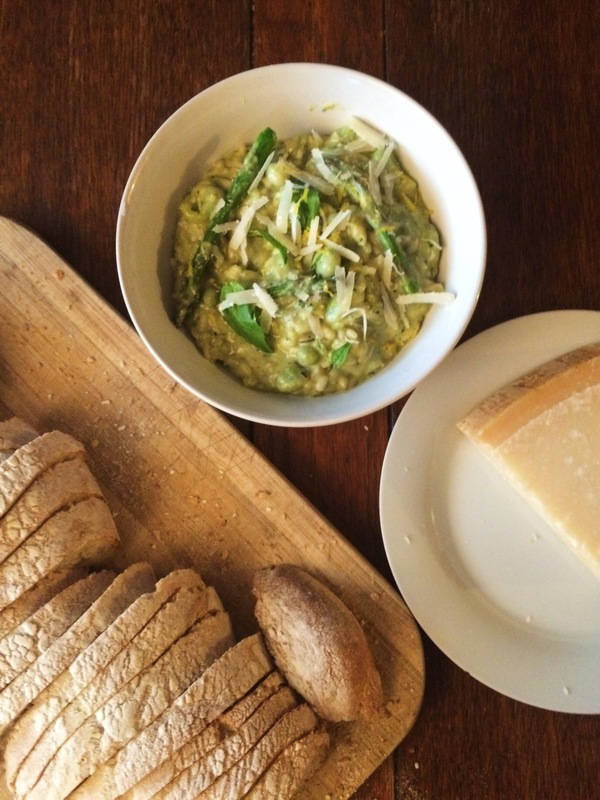 Basically, this dish is now full of all the best things in life…wine, basil, cheese. The result is super happy. Add bread and pour a glass of whatever wine you used to make it. Open the windows and let the springtime in. Of course, if where you live it’s only 40 degrees F in the spring time, then you can turn on your heat lamp, close your eyes and pretend you’re in Italy. Trim about an inch off the asparagus and discard. Then chop the tips off and set aside. Bring 6 cups of water to boil. 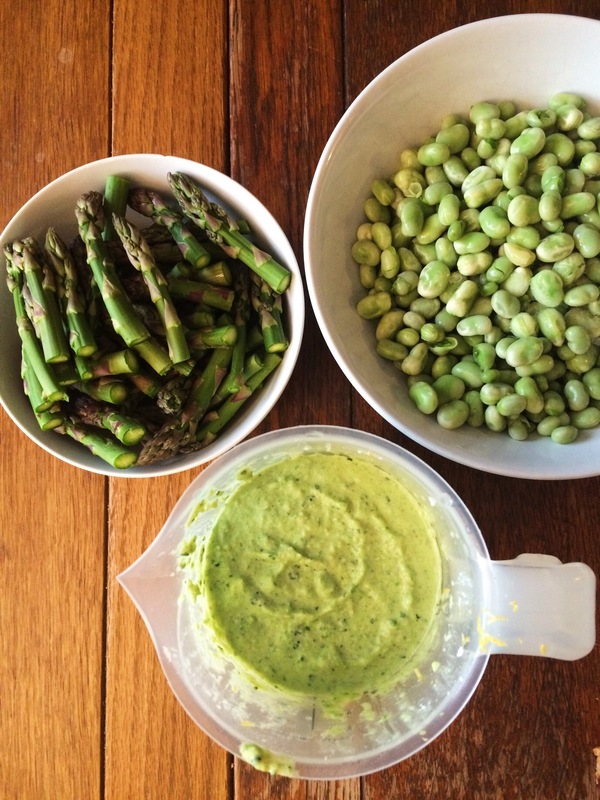 Cook the asparagus stalks for 4 minutes or until softened. Remove with a slotted spoon and allow to cool. Add the stock cubes to the pot and allow to dissolve. Heat the oil in a deep skillet or enamel iron casserole (Le Crueset). Add the shallot and cook for five minutes, then add the garlic for a minute more. 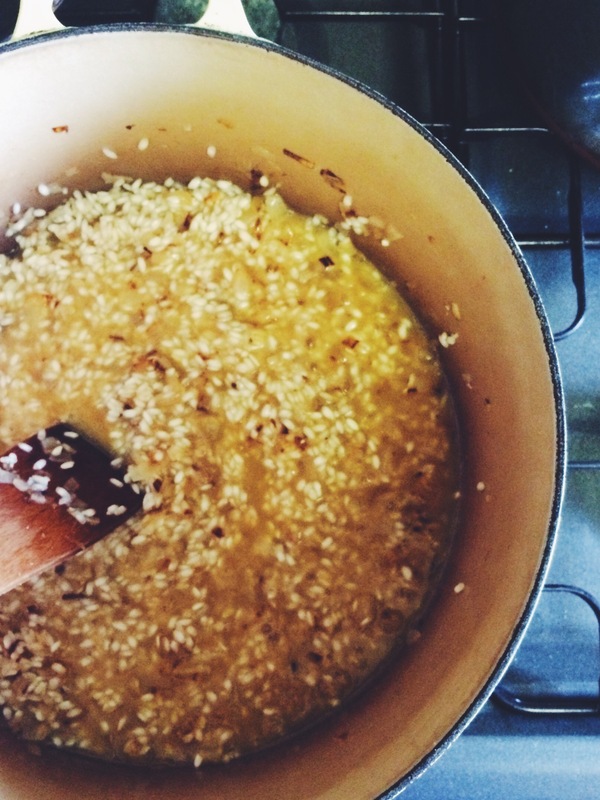 Stir in the risotto and then pour in the wine. Allow to bubble until wine is absorbed. Add the stock a ladle at a time, stirring until absorbed before adding the next ladle. This takes about thirty minutes. 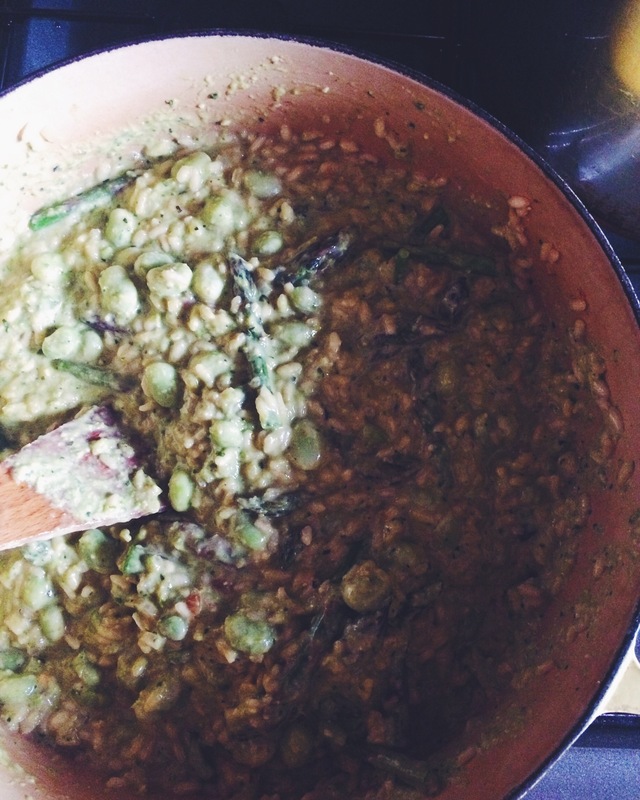 When the rice is cooked, add the broad beans and asparagus tips. Cook and stir for about five minutes or until the vegetables are tender. Then stir in the pesto. Season with salt and pepper. Serve immediately with bread and parmesan cheese.